The peaceful Templars' Abbey is a rare haven of tranquility for road weary travelers. And so you found it when you arrived late last night. That serenity was shattered this morning with the discovery of the lifeless body of Brother Adelmo at the foot of the Monastery's cliffs. Did the usually nimble-footed Brother slip to his death? Or did someone help him in his fall? 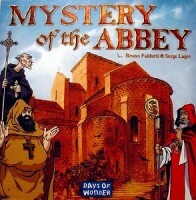 Mystery of the Abbey is a new kind of "whodunit" game of deduction and intuition, set in a medieval abbey. Players compete and collaborate to solve the mystery by moving through the Abbey's beautifully rendered board and questioning their brethren. Gameplay is in turn fun, captivating and tense; the atmosphere, vivid; the immersion, complete. Constant interactivity between the players, intelligent questioning and dynamic intrigue make Mystery of the Abbey the game of choice for an hour of fun with friends and family alike. Add a Review for "Mystery of the Abbey"